Stockopedia subscribers gain access to our unique set of proprietary StockRanks™. 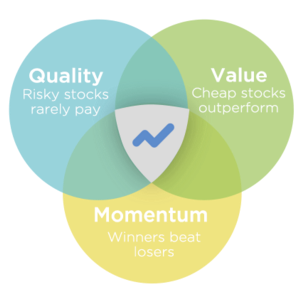 These ranking factors have been designed to aid in the selection of cheap, good quality, improving stocks - the kind of stocks that are proven to consistently beat the market over the long term as part of a balanced portfolio - while avoiding the kind of expensive, low quality and deteriorating stocks that can lead you to the poor house. What works in investing is a completely open secret - cheap stocks tend to outperform expensive stocks, and stocks which surprise the market's expectations tend to continue to surprise. The problem is that both these general strategies (known as value and momentum) have a tendency to be extremely volatile when used alone. Value strategies can under perform the indices for significant periods of time while momentum strategies can suffer sharp reversals. It is well understood though, both by practitioners and academics that blending the two approaches has the twin impact of lowering the downside risk, while preserving the upside potential. Value + Momentum has been found to be a market beating strategy not only in the stock market but across bonds, currencies and every other asset class. Beyond this simple approach the returns to value (and indeed growth) strategies can be improved by selecting higher quality stocks. This process is often referred to as a QARP (quality at a reasonable price) or GARP (growth at a reasonable price) investing process. A recent famed research paper titled "Buffett's Alpha" showed that almost all of Warren Buffett's outperformance over the years can be explained by the 'general tendency of high quality, safe, cheap stocks to outperform'. Meanwhile the late, esteemed finance professor Robert Haugen proved that cheap, quality, growing stocks with momentum have a tendency to dramatically outperform the market. Stockopedia's StockRanks™ are designed to help investors find these kinds of stocks and implement these kinds of strategies. The work that we do towards the formulation of these rankings is very similar to work done in top Hedge Funds and Asset Management firms on Wall St and in the City but with a key difference. Ultimately institutional investors are unable to invest in many of the best opportunities as they struggle to trade in small sizes. Stockopedia StockRanks can help individual investors to find the opportunities in the gaps of the market that the professionals fail to grasp. Our approach is inspired by that of James O'Shaughnessy who in the 4th edition of the classic What Works on Wall St built composite factors based on averaging the rankings of various ratios for every company in the market - finding the portfolios generated using composite ranks outperformed those composed across individual ratios (such as the P/E). Similar approaches to generate composite scores have been employed by institutional giants such as Thomson Reuters, Morningstar and S&P. We calculate these ranks for every company in the market, sum them and then re-rank the output from 0 (worst) to 100 (best). The stock showing the highest Composite StockRank will have the highest score across all 3 contributing ranks. Please see the links above for a detailed breakdown of each component rank. This 'QVM' StockRank™﻿ ( based on Quality, Value and Momentum) has performed exceptionally well in our recent backtests as well as in the academic literature. N.B. Originally we had provided subscribers with a composite GrowthRank which was blended with the other Quality, Value and Momentum rankings into what we call the composite QVGM rank. Our backtests proved, in line with research by other third parties, that growth is not a very predictive factor of future stock returns. Also Value is such a strong factor that its impact was diluted by the addition of Growth Rank. It should be noted that both Quality and Momentum are highly correlated with future growth, and in fact may be predictive of growth. We still maintain the GrowthRank for legacy reasons, and provide the QVGM rank for interested subscribers in both the screener and in tables. The ranks are updated every day before the market opens once our batch process has completed. The Value and Momentum ranks are dependent on the company's share price, so they can change daily. As the ranks are also relative to the rest of the market, a company's share price may not move but the ranks can change due to the changing ranks of the rest of the market. The Quality Rank tends to be more stable as it is more dependent on financial statement releases. The biggest changes in StockRanks will happen after either large share price moves or new financial statement announcements. It should be noted that there are many ways of using the component ranks aside from individually or as a composite. Value + Momentum when paired alone is seen as one of the most successful stock market strategies. Societe Generale Quant team publish a 'WISE' investment strategy that significantly outperforms the market combining a simple summed score of value and momentum factors. Value + Quality when paired is very similar to Joel Greenblatt's approach in his famous book 'The Little Book that Beats the Market'. Our own backtests have shown that this approach is highly effective at generating market beating returns and is most similar to the approach of Warren Buffett and other investors who like to buy quality stocks when marked down. Quality + Momentum may ignore price, but also performs remarkably well. Many traders, such as Bill O'Neil, are willing to buy highly priced stocks as the real market leaders tend to sell at a premium. These are often stocks that are expensive for good reason - due to continued blistering share price growth, earnings growth and exceptional cashflow, profitability and financial results. These stocks can still be worth purchasing, though greater caution should be taken with any highly priced stock as the volatility can be high (e.g. if the company starts to disappoint). The essential rule is that focusing on stocks that score well on at least 2 of the three key ranks is a statistically positive approach. Nothing can protect investors from the vagaries of the market and stock market drawdowns, but placing one's investments in higher probability situations is a sensible approach. There are some Screening Recipes published on the homepage for those that want to get started quickly. It should be noted that Growth in general has been shown to have strong mean reverting tendencies. What this means is that strong growth stocks often become moderate growth stocks. We caution investors from getting too optimistic about Growth forecasts in general. Our opinion is that it makes more sense to focus on Quality than Growth - academia and practitioner experience suggests it is more predictive of future growth. StockRank, ValueRank, QualityRank, MomentumRank and GrowthRank can all be used as screening criteria in the Stockopedia Screener. Research backed - The are designed to reflect the core findings from academic stock market literature into factor investing. Educational - They are designed as a framework to help our subscribers understand ‘what works’ in investing in an abstract but effective fashion. Our hope is that investors will use the StockRanks as a starting point to learn about other methods. Comprehensive - They are designed to score every company in the stock market and leave no sectors out. We have deliberately constructed them so that they are as effective in profit-less mining stocks as they are in consumer defensive stalwarts. Dimensional - They are designed to be used both top-down as a screening library and bottom-up on a stock by stock basis on StockReports. Scalable - They are designed to both satisfy individual investor preferences amongst smaller companies while being effective for larger institutional investors amongst larger companies. Fractal - They are designed to scale fractally across local and global markets. For more information on this please see the later readings on the local, regional and global StockRanks. Effective - They are designed to beat the market ;-).